Bruno Richard Hauptmann was murdered by "justice" 81 years ago on April 3, 1936. None of us are safe from this kind of "justice" as long as the death penalty exists. This website is committed to the ongoing investigation of a very old crime. The information contained here amounts to several hundred pages of collected data. It is combined with a good mix of opinions by a variety of skeptical individuals who continue to study and debate this intriguing case. Links to other websites on any of these pages do not necessarily reflect endorsement of the theory that Bruno Richard Hauptmann was innocent or that Charles Lindbergh was guilty. My original intention in publishing this site was to scrutinize and test Ahlgren and Monier's shocking, but rational, theories which were published by Branden Books in 1993. After six years, and the encouragement of so many dedicated people on the LKH Public Forum, this site has grown into a gigantic depository of archival material that is found nowhere else online - and it is still "unfinished." 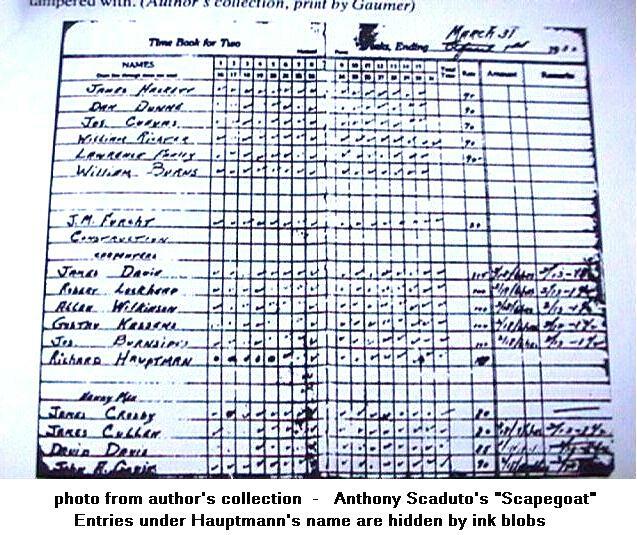 Ever since the publication of Anthony Scaduto's Scapegoat in 1976 there has been more than enough evidence to warrant an official re-investigation of that tainted event known as the "Trial of The Century." Yet, the case remains closed in spite of a mountain of evidence that clearly shows how an innocent man was framed, in 1935, by desperate New Jersey cops and a politically ruthless prosecutor. For more than 60 years Anna Hauptmann fought for exoneration of her husband. In the mid 1980s, based partly upon Scaduto's newly disclosed evidence, she made what would become her final appeal, to NJ Gov. James Florio. His useless advice to the courageous and broken hearted widow was that "history" would have to be the judge of whether her husband was framed by Attorney General David Wilentz and the New Jersey State Police. History?! What a cheap excuse. There really is nothing cheaper than "history" when it comes to answering for a frame-up. No one pays and no one apologizes. Smart politics. The True Crime The true Crime of the Century was not a kidnap/murder but rather, the execution of an innocent man - the murder of Richard Hauptmann. Since it is never possible to reverse such unjust punishments, many of us would argue that the death penalty be abolished. If, almost seven decades later, we find ourselves questioning the validity of a death sentence how can we ever be certain that our Capital Punishment Laws are not simply feel-good, legalized murder laws? "But, a jury found him guilty according to the laws of his day. We must agree with the ruling of the Flemington Court - if they said he was guilty, he must have been guilty." According to this "logic" we have no right to ever question the verdicts of Grand Inquisitors, Jim Crow juries, or Stalinist show trials. Life sentences, rather than irreversible death penalties, would, at the very least, assure any future innocent defendants - (the rest of us!) - that no one in the United States would ever again be murdered by "justice." Richard Hauptmann was put to death only nineteen months after his arrest. Compared with today's more cautious judicial timescales his defense took no more than the blink of an eye. The Tragedy On May 20, 1927, Charles Augustus Lindbergh became a world hero. He was the first aviator to fly across the Atlantic Ocean in a solo flight. After 33 hours The Spirit of St. Louis touched down in Paris and the handsome, 25-year-old pilot became a living god. His life, only five years later, would become known as a public tragedy when, on a Tuesday evening, March 1, 1932, his twenty-month-old son, Charles, Jr., disappeared from his crib. After receipt of numerous ransom notes the sum of $50,000 in cash was handed over to a man in a Bronx cemetery known only as "John". On May 12, 1932 the child's decomposed body, lying in a shallow grave only two miles (walking distance) from his home, was found by a truck driver. The baby had been dead since the night of his disappearance. 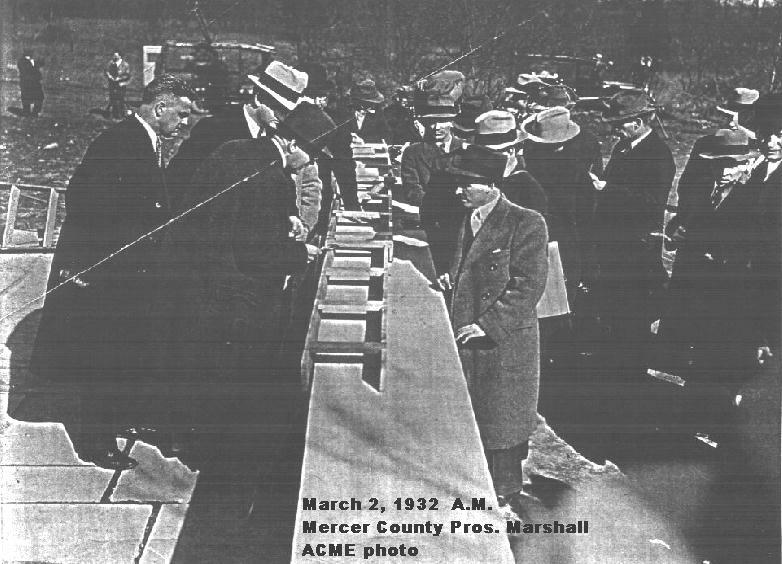 Lindbergh, in command of the entire investigation from its inception, ordered an immediate cremation. No legitimate autopsy was ever performed. There is no corpse to exhume for forensic testing. Lindbergh scattered the ashes of his firstborn child out of an airplane in August 1932 and a long line of "real Lindbergh babies" have staked their claim for a share in the Lindbergh fortune ever since. The Trial Two and one half years later, on September 19, 1934, a suspect, Bruno Richard Hauptmann, was arrested. He had been traced through a gasoline purchase he made in upper Manhattan in which he used a gold certificate that had been part of the Lindbergh ransom cache. 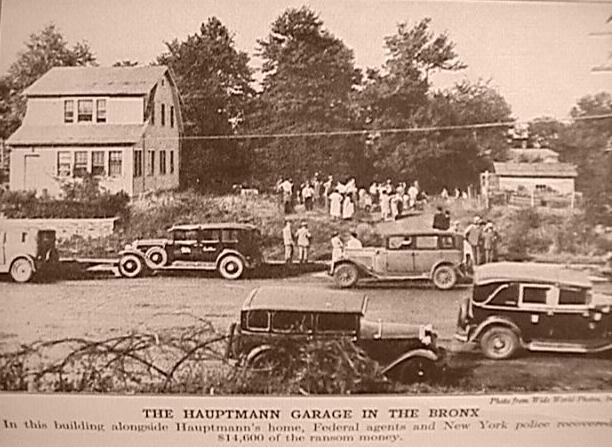 Hauptmann was extradited from the Bronx and tried for murder in Flemington NJ in 1935 upon what almost every researcher has admitted was questionable evidence. His explanation - labeled the "Fisch Story" by prosecutors - has never, to this day, been proven to be false. Hauptmann was found guilty in Feb 1935 and sent, in spite of the selfless efforts of NJ's (Rep) Governor, Harold G. Hoffman, to the electric chair on April 3, 1936. He was convicted and put to death as the lone kidnapper and lone murderer. So, why did Prosecutor David Wilentz, under pressure from Governor Hoffman and others, offer him a last minute deal to commute his death sentence to life in prison - in exchange for the names of his accomplices?! Hauptmann never wavered from his original claim that he was completely innocent. He chose to die rather than lie. Offered $90,000.00 for his public "confession" by a Hearst newspaper Hauptmann spurned all monetary offers and swore he had nothing to do with the crime. Outrageously unfair news coverage presented what appeared to be a public outcry for the electric chair - but there were many who were not so sure. Some of the more famous skeptics of the day were Clarence Darrow and Eleanor Roosevelt. The famous aviatrix who resembled Lindbergh, Amelia Earhart, wrote an eloquent plea to the NJ Governor. Very few people, however, were able to think rationally amidst the rampant hostility, caused by grossly distorted news coverage. Xenophobic sentiment played a major role in the Flemington Courthouse Circus. Hauptmann's defense attorney, Ed "Death House" Reilly, was literally bought and paid for by a Hearst newspaper, in exchange for that lawyer's privileged inside "scoop." Reilly spent no more than 40 minutes with his client over the course of the entire trial. Hauptmann, an immigrant, never had access to a translator during the entire two- month trial yet the State of NJ "bugged" every conversation he had with his lawyer or wife. No Discovery After sixty nine years this case will not die. Frightening discrepancies point to a prosecutorial frame-up. No one could ever say that Hauptmann's trial was fair. Even those who believe he was guilty agree it was an unfair trial. 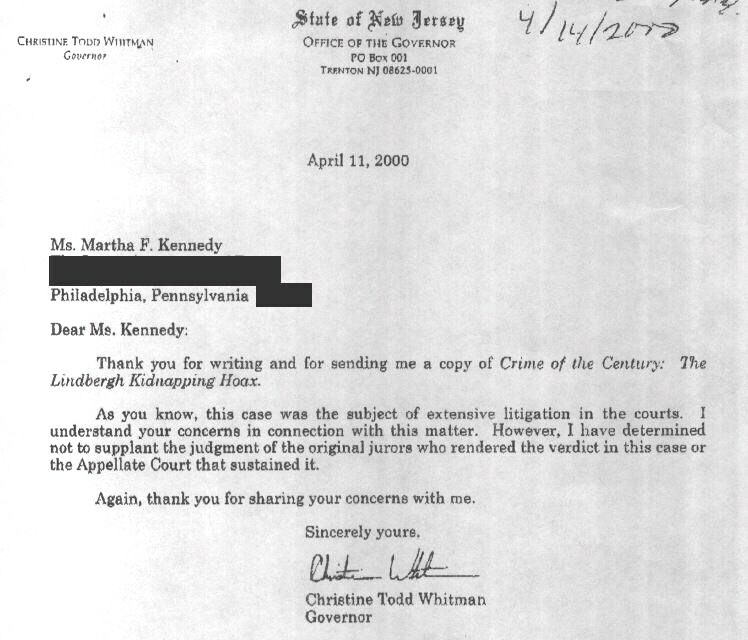 Exculpatory evidence, available at the time of the trial, was suppressed. The Defense was not advised of such evidence nor were they allowed to handle or view the supposedly incriminating evidence. Without the vital safeguards of our modern legal system's "discovery" requirements - set in place to protect the integrity of American trials - this Trial of the Century turned out to be the Lynching of the Century. The Truth? The public, and especially the Hauptmann family, deserves to know the truth. If Hauptmann was innocent then the question still remains - who did kill the Lindbergh child? Doubts about Hauptmann's guilt have caused a variety of interesting theories to arise over the years. The most common, of course, is the "Gang Theory"
There is also a popular theory, originated and explained by the late Noel Behn in his book Lindbergh : The Crime - that Lindbergh's' sister-in-law, Elizabeth Morrow, killed her nephew in a jealous rage over having been spurned by the handsome and famous aviator. Wayne D. Jones, another tireless researcher, claimed, in his book Murder of Justice: New Jersey's Greatest Shame, that the Lindbergh baby was kidnapped with the help of the family butler, Oliver Whately. The bitter truth of the doomed man's words will always remind us of the blight upon the American justice system that Flemington's legacy still represents. This website challenges, not only the tainted evidence of Col H Norman Schwarzkopf's NJ Police Dept. but the twisted propaganda published by NJ Police-authorized writer, Jim Fisher. 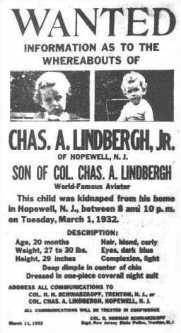 His books, Lindbergh: The Case and The Ghosts of Hopewell have been touted as "objective" but only by people who do not know or understand this case. Fisher, a rigid defender of the Flemington trial, its verdict, its Judge, and its Prosecutor, has attempted to "set the record straight." But, all he has really accomplished, in our view, is the perpetuation of a very old hate crime. But, let's never forget that Anna Hauptmann died, on October 10, 1994, waiting for history. - except for a ladder. It was found on the muddy ground Tuesday evening March 1, 1932 approximately 50 yards from the baby's window. 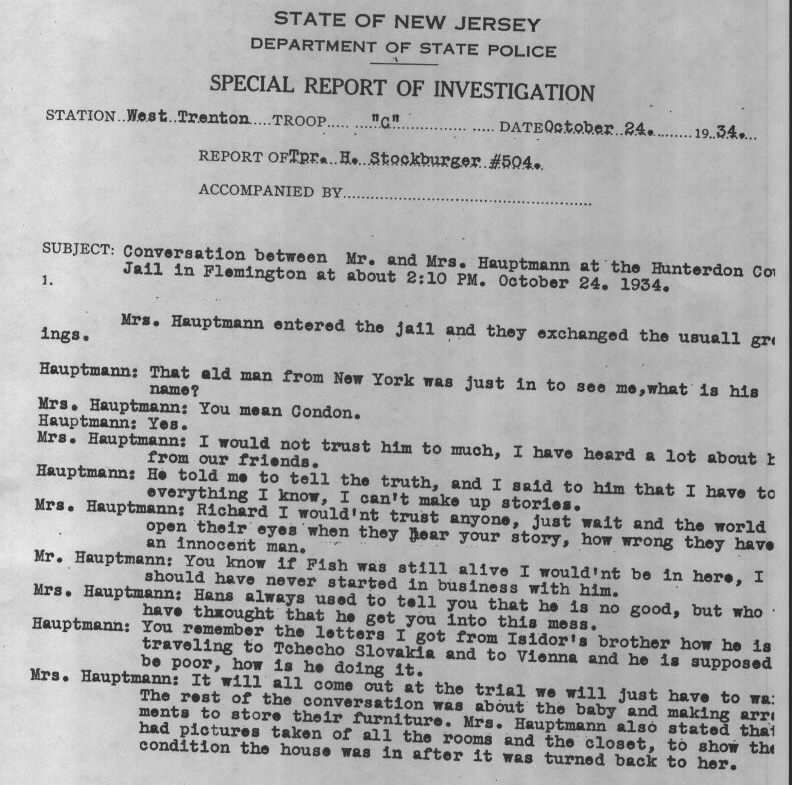 After having extradited Hauptmann from the Bronx, (where the only charge against him was extortion), NJ Attorney General, David Wilentz, desperate for any hard evidence against Hauptmann, would later claim that a single rail (Rail 16) had actually been a piece of floorboard in Hauptmann's attic. This obviously fabricated evidence was used by NJ Police to criminally place Hauptmann in NJ on March 1, 1932. 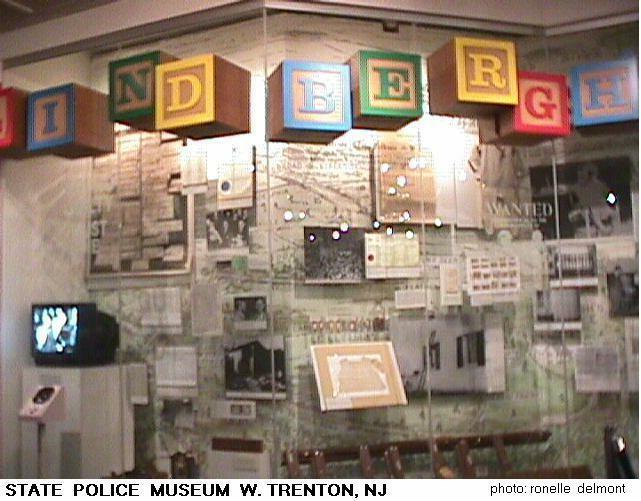 Forensic testing of the "kidnap ladder" and the attic floorboard - both on public display at the West Trenton State Archives & Police Museum - is necessary to exonerate Hauptmann. Authorization for DNA testing, however, needs to come either from NJ's Attorney General or, from New Jersey Superintendent of Police. 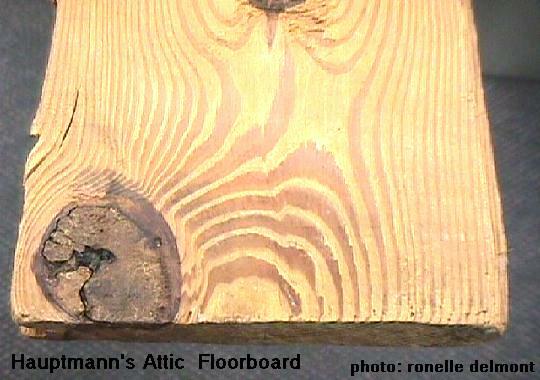 If the floorboard's DNA does not match the ladder rail the pieces cannot possibly be from the same tree. If they are not part of the same tree it would be conclusive evidence of an arranged frame-up by Lt. Louis Bornmann, the "discoverer" of the "evidence" and Prosecutor David Wilentz. Lt.Bornmann moved into Hauptmann's Bronx home and "found" this "evidence" by himself, without witnesses, after 37 FBI and NYC cops had already scoured Hauptmann's attic 19 times! 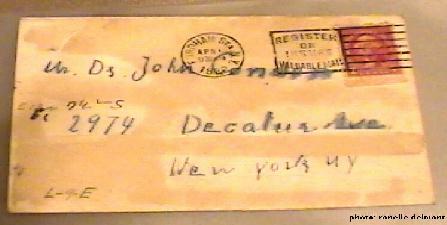 DNA and The Envelopes There are also several envelopes in the NJ State Archive that may hold the key to the mysteries surrounding this case. In 1993, Stephen Monier, a Goffstown, NH Police Chief and Gregory Ahlgren, a Manchester, NH defense attorney, presented their shocking, but plausible, research pointing responsibility for the child's death, not to any stranger nor to any sort of a gang - but to the baby's father himself. 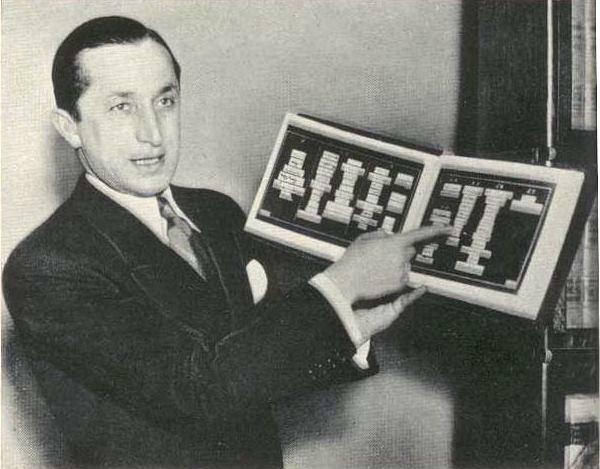 By re-investigating this case as if it happened today, rather than the hero-worshipping world of the 1930s, Ahlgren and Monier have given spellbound readers a new understanding of how easy it was for an idolized celebrity to take charge of the most sensational investigation the country had ever known. Charles Lindbergh commandeered the entire kidnap investigation from the moment it began. 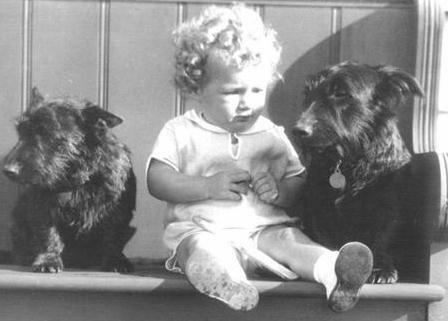 All law enforcement officers - including NJ Police Chief H Norman Schwarzkopf (Senior) - took orders from Charles Lindbergh, the missing baby's father! No Kidnapping? The Crime of the Century, as an authentic kidnapping, has now been debunked by Ahlgren and Monier. Their book offers so many logical reasons why there may never have been a kidnapping at all. And so, Charles Lindbergh, Mason, Eugenicist, social misfit and sadistic prankster, emerges as the most likely suspect. He may have negligently killed his son during a botched kidnap prank (his pranks were usually quite cruel) or during rough "play" with his toddler. Lindbergh's belief in Eugenics (White Supremacy) also makes him suspect since it is possible his firstborn son was severely harmed during a 14-hour flight he forced his wife to undergo while in her 7th month of pregnancy. If there was anything "wrong" with the Eaglet Lindbergh might even have wanted to be relieved of the "stigma" to his name and reputation. 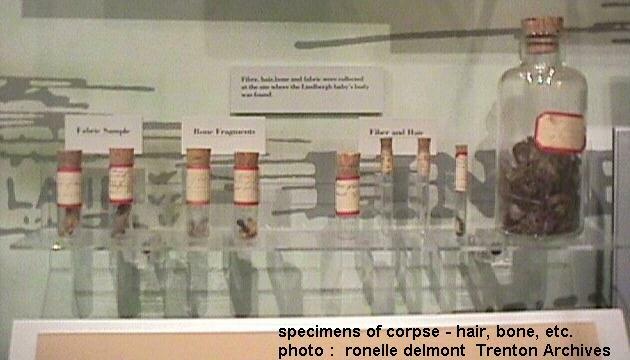 Forensic specimens of bone and hair of the unfortunate child were removed from the NJ State Archive by the Lindbergh family after the shocking disclosure that Charles Lindbergh had sired 7 children with 3 German women in the 1950s. But, in either case - accidental or purposeful - the "kidnap of the century" appears to have been a hoax, a la Susan Smith or JonBenet Ramsey. A devious ploy to account for a missing child. The Trial Adoring jurors at Flemington in 1935 were not suspicious of Lindbergh's outrageously false ear-witness testimony. At the Flemington trial Lindbergh was unable to remember where he had been during the day of his son's disappearance yet he claimed to remember Hauptmann's voice, shouting from afar only two short words - 3 years earlier! His original testimony, at the time of the cemetery drop-off, revealed that he had been sitting in a car with the windows rolled up - more than half a block away. Lindbergh's testimony at Hauptmann's trial is disturbing. Not only were the jurors dazzled by the famous aviator's presence but none of them thought to question Lindbergh's ability to identify a person in this manner. They must have assumed that the daredevil who flew to Paris also possessed supernatural hearing. It is simply not possible for human hearing to be that keen nor is it possible for human memory to be that reliable. Based upon such horrendous standards Hauptmann's execution was really the murder of justice itself. And so, if Ahlgren and Monier are correct, Charles Lindbergh, as well as the State of New Jersey, deserve inexcusable blame for the framing of an innocent man. Anti-Semitism? Was Charles Lindbergh really an anti-Semite? Could that question have anything to do with this case? In spite of recent reappraisals by family-authorized writer Scott Berg, youngest daughter Reeve Lindbergh and the most unlikely of all apologists , Steven Spielberg, many people still believe Charles Lindbergh was nothing less than an unrepentant pro-Nazi, anti-Semite. This belief is not necessarily based upon what Charles Lindbergh said in his public speeches before the Jewish Holocaust but for all the things he never said after it was over. Some "gifts" do need to be given back. 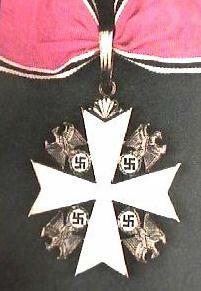 Hitler's medal, - the Service Cross of the German Eagle With Star - adorned with four swastikas, was presented to Lindbergh by Hermann Goering, Though many people begged him to give it back Lindbergh stubbornly refused saying it would be an insult to Germany. It has been, for over 60 years, part of the Lindbergh Collection at the St Louis Missouri Historical Society were Lindbergh donated this highly offensive possession which he continually, even after the war, refused to denounce. It has been viewed by thousands of people as part of a touring Lindbergh memorabilia exhibit throughout the country. Much worldwide respect would have come Lindbergh's way had he publicly retracted some of his "values" before he died in 1974. Lindbergh found no fault, no mistake, no regret nor any corrections necessary in his own behavior or values. He believed he was a perfect individual - everyone else was wrong. At the time of his death he continued to maintain a belief that the U.S. should not have fought Hitler. Ahlgren and Monier have provided an intriguing psychological theory to account for Lindbergh's pre-war attitude in relation to his participation at Hauptmann's trial. Tania M. Gensemer The idea for this website was originally a school project created by a high school student who was not afraid to think skeptically. Tania M. Gensemer was outraged by the injustices depicted in a 1996 HBO movie, which is based on Sir Ludovic Kennedy's book The Airman and The Carpenter . Her interest in this case led to an attempt to find the truth, without prejudice. After creating some of these pages, at age 16, she was very quickly threatened by the editor of a New Jersey newspaper claiming to have copyrights to some of the photos she originally used here. That newspaper is a diehard political supporter of David Wilentz - the man who ruthlessly prosecuted the unfortunate defendant. The intimidation of a high school student (though she actually listed all of her sources) is one of the reasons this website now exists. Although some people may be disturbed by some of the theories on this site, they deserve to be tested in "the light of day." Ronelle Delmont has revised and rewritten all of Tania's original 45 pages and will continue expanding this website in her honor. Tania's high school project was, in 1998, the only website questioning the right of the State of New Jersey to kill a man under enormously spurious conditions. 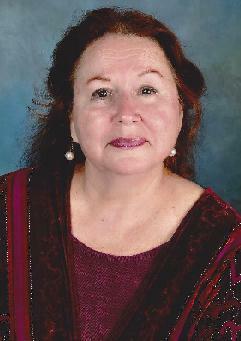 Ronelle Delmont A popular lecturer and book reviewer in South Florida. She has been enlightening audiences about Crime of the Century: The Lindbergh Kidnapping Hoax as well as hundreds of other books for almost twenty years. The L.K.H. Skeptics Much valuable information on this website was contributed to the attached message board - The Lindbergh Kidnapping Hoax Public Forum - by a host of very dedicated skeptics - and non-skeptics. Their participation in this ongoing debate has lasted for six years - and shows no sign of waning. Thanks to Siglinde Rach, Kurt Tolksdorf, Sue Campbell, Sam Bornstein, Steve Romeo, Michael Melsky, Philip Migliore, Richard Sloan, Tanialee, Bob Aldinger, Harold Olson, et al. Many of their LKH message board contributions will be scattered throughout these pages. Mark Falzini Special thanks to Mark Falzini, Archivist at the W Trenton, NJ State Police Museum, who manages to remain objective in spite of the demands made upon him by researchers, theorists, and "real" Lindbergh "babies" - some of whom have been embattled for decades.